Dilaceration is the anamolie in the tooth shape and its structure and it refers to a sharp bend in the tooth which can be in the crown portion or in the root, making sharp angles at the junction of the crown and root. The abnormal Angulation may be present anywhere along the the length of tooth. It occurs as a result of trauma to the predecessors of the permanent teeth, and it is seen that Dilaceration of the root is more common than that of crown. The most commonly involved teeth are the Permanent Maxillary Incisors followed by the mandibular anterior teeth. Occasionaly decidious teeth are also involved. Dilaceration is seen in both Permanent and Decidiuos teeth. Mandibular incisors which exhibit dilaceration often show full eruption unlike Maxillary anterior teeth. After eruption these teeth often show Labial or Lingual inclination. Mandibular teeth with dilaceration are often Non Vital and exhibit a periapical inflammatory lesion. Extraction of Primary deciduous teeth should be “Extracted” if they demonstrate undesired Resorption and result in delayed eruption. Grossly deformed teeth require Surgical extraction because of extensive deformation of the affected tooth, repositioning and perforation of the buccal alveolar ridge by the mispositioned root. In mild dilaceration cases, no treatment is required. how can we identify the dilaceration clinically with out X-ray? As i already mentioned in the post Dilaceration of the tooth maybe coronal or root type, and clinically Coronal dilacerations are appreciated more than the root type, Root dilacerations are better left untouched, and the crown type are treated for aesthetic, occlusion, oral hygiene purpose. The root Dilacerations are considered only in case o extractions where these may cause problems while extraction. You may want to consider root dilaceration even when not extracting. As the name implies, it is a mangled formation of root, and as with anything that gets mangled, there is often a reason, such as a cyst or other anomaly in the bone. As to detection without x-ray, use your hands to see, develop a feel for what a tooth, held by the crown and feeling the bone surrounding the apical area, feels like when observed passively, as well as actively. Dilaceration is a developmental disturbance in shape of teeth. 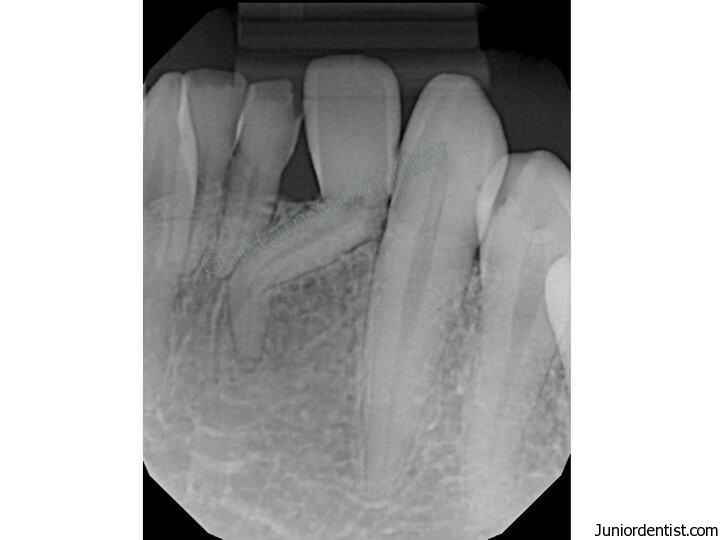 Dilaceration of permanent successors is one of the most common complications of trauma to the deciduous teeth. Dr. Varun. I am a pediatric dentist from Colombia and I am now in the process of writing a chapter on dental anomalies for a book. I came across a beautiful x ray of a lower permanent incisor with a root dilaceration. I want to request your permission to use this picture in my chapter, and of course, due credit will be given to you. Thank you in advance for your response and i hope to hear from you soon. does dilaceration have any effect on oclusion?